I have a poor track record with movie screenings, being one of the few people to walk out halfway through a sneak preview of “Boogie Nights,” which I thought was terrible. Of course the kid who conned me into seeing it told me it was “a Burt Reynolds movie” (a few years ago, any passing warm body on Colorado Boulevard in Old Pasadena was at risk of getting dragged into a theater for a screening). The polka music inserted as a placeholder for the soundtrack didn’t help. Imagine my surprise when everybody I knew absolutely adored it. 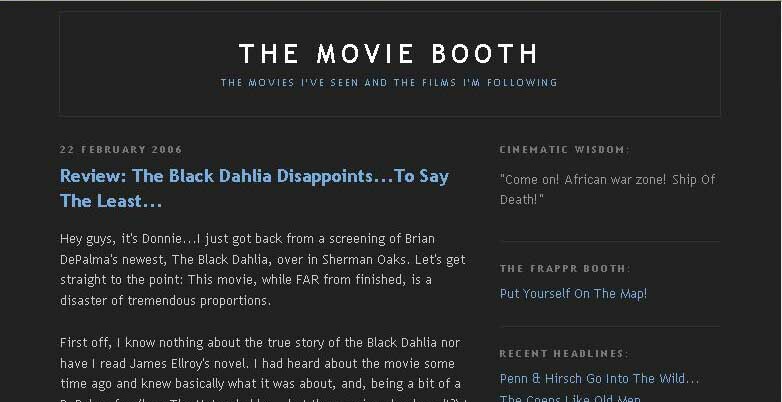 So I said “no” when someone asked me last week if I wanted to get into the sneak screening of the Brian De Palma movie “Black Dahlia” on Tuesday night in Sherman Oaks. Some people burn ardently for a movie deal, but I’m not one of them. I’m still thinking of David Thomson’s line in his New York Times review of Steve Hodel’s “Black Dahlia Avenger”: “Kevin Spacey should buy the film rights to this book quickly.” I don’t think there’s any way Hollywood could do a film about the Black Dahlia without turning it into a gruesome slasher flick. And I’m certainly not interested in that. The verdict from someone who did attend last night’s screening: This movie, while FAR from finished, is a disaster of tremendous proportions. Given the quirks of blogs, there’s no telling how long this will stay up, so here’s a screen shot. On the other hand, after reading a New York Times article about violinist Christian Tetzlaff yesterday, I dug out a recording of his fabulous December 2002 debut with the New York Philharmonic. Not to brag, but I do have my moments. Time for the autopsy in the coroner’s offices in the basement of the Hall of Justice. “Mogul” calls the area “rat-infested.” Sigh. To the end notes once again, Watson. Hm. The sources are Will Fowler’s “Reporters” and coroner’s inquest documents. Will had vivid stories about the coroner’s office, but none of them involved rats. Even John Gilmore's account in "Severed" attributed to the nonexistent Detective Herman Willis doesn't mention rats. I don’t buy it. And now the autopsy, performed by Dr. Frederick Newbarr and Dr. Victor Cefalu. Ah this interesting. One of the telltale markers in bad Dahlia research is the misspelling of Cefalu as “CeFalu” in “Severed.” (Like the Crime Library. Though to be fair, they have asked me to contribute something and I’ve been too busy so far). Wolfe sidestepped that one at least. Uh-oh. We have just gone from warp speed to impulse power. This could take a while. As Peter Abelard used to say: “Sic et Non,” though not about “true” crime books. I can’t think of a single original source on the Dahlia case that mentions a heavy metal object. And there’s nothing about deep knife lacerations, just lacerations. Now this is bad work, nothing more than an out and out lie. Newbarr never said anything like this to anybody as far as I know. But let’s check to be sure. Here’s a little background that should help narrow the source: INS (International News Service) was owned by Hearst, so that would indicate a story that appeared in another Hearst paper (for example, the San Francisco Examiner) when it picked up a Los Angeles Examiner story. Back to the increasingly well-thumbed end notes. Supposedly this is from the Examiner, Jan. 17, 1947. Now there’s absolutely no reason for the Examiner to run an INS story about something that happened locally, so this is extremely suspicious. Now there’s a reason Newbarr not only didn’t say this but wouldn’t have said it. Note that Elizabeth Short had been struck in the head. The doctors I’ve consulted tell me that when her face was cut she was almost certainly unconscious from being hit in the head. Alive, yes. Conscious, no. A day on 2½ paragraphs. Not as bad as a day on one sentence, which I think is a record. But there’s no way to be quick and thorough. And I’m all for being thorough. 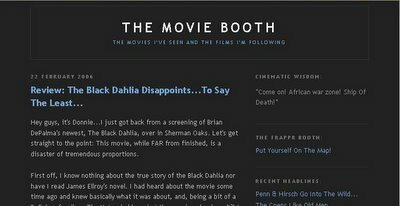 Feedback, by the way, seems to be 100% in favor of continuing on Donald H. Wolfe's "Black Dahlia Files," so I shall. Houghton Mifflin (65.213.77.129) 1 hour, 5 minutes.